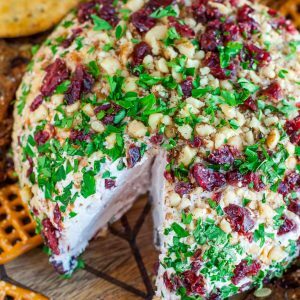 Snag some leftover cranberry sauce and swirl it into this super luxe cranberry walnut holiday cheese ball! Kick it up a notch with sprinkle of cinnamon, a drizzle of honey, and a whole lot of flavor! I had zero intention of diving into wintry holiday fare when we’ve barely begun to experience Fall weather here in Florida buuuuut… I couldn’t help myself! Technically I have a really good excuse. I was cleaning out the freezer, doing some major re-organizing, when I found last Winter’s cranberry bounty. The second I laid eyes on those gorgeous berries I had to have them, there was no putting that bag back into the frozen abyss, no way! 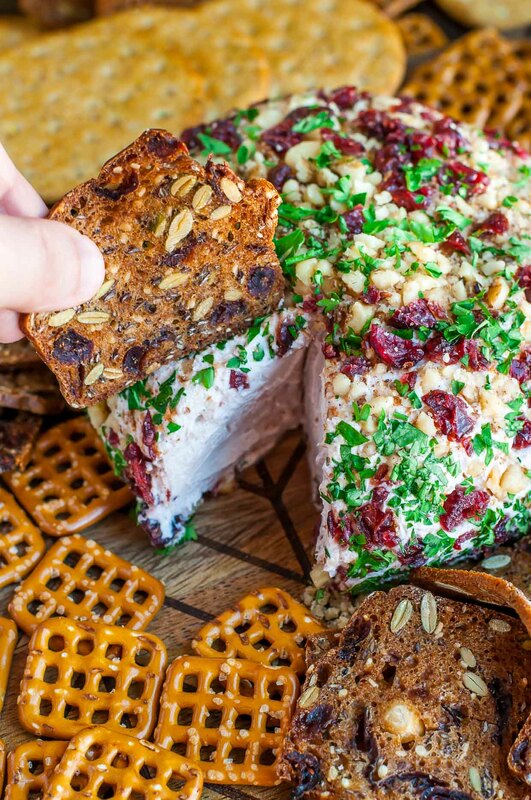 I made my go-to cranberry sauce and after tucking a jar away for later, I swirled the remainder into this super luxe cranberry walnut cheese ball. 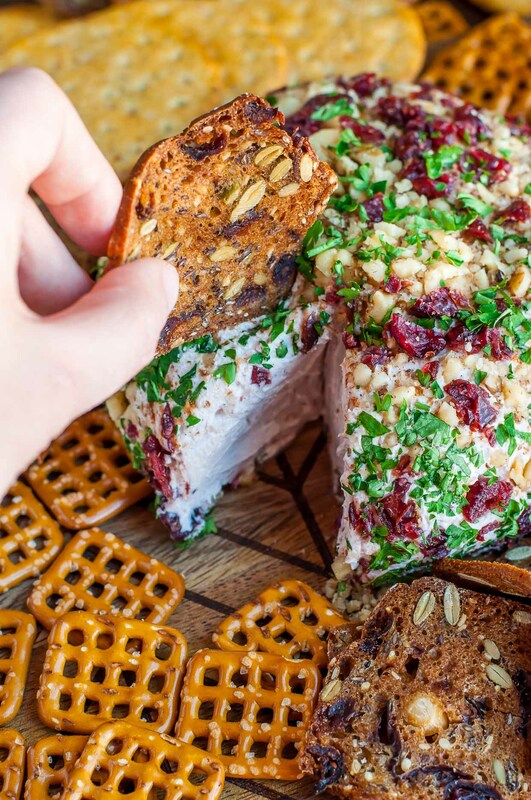 I’ve done this many a times with goat cheese and decided this festive combo would be positively stellar with cream cheese too. There’s something about pairing sweet and tart with creamy and nutty and cinnamon-y goodness (humor me and pretend that makes sense) that works so perfectly well. I could spread this on everything from crackers to pretzels to my morning bagel. Quick! Someone toss me a bagel! The leftovers even make the most amazing sandwich spread in all the land — really! Spread it on a buttery bakery croissant then pile it mile-high with crisp romaine lettuce, fresh cucumber, and turkey. Now take the biggest bite ever and… SWOON! Sprinkle with a little extra cinnamon if you're as cinna-crazy as we are! Leftovers taste deeeeeelicious spread on pretty much everything in sight the following day and will keep for up to 4 days. The links above are for my delish crock-pot cranberry sauce. Need it fast? This speedy stove-top cranberry sauce is ready in just 10 minutes! Serve this heavenly spread at room temperature with sliced green apple, whole grain crackers, fruit and nut crackers, pretzels, and crunchy celery sticks. Or just go crazy and spread it on everything in sight! The glory of a cheeseball is you can literally do anything to them! Pecans would be a tasty addition to the walnuts (LOVE the walnut-pecan combo) and even a little fresh rosemary could be let in on the fun if you’re a fan. Let your tastebuds be your guide and have fun with it! Last week i canned my own cranberry sauce and tried this cheeseball tonight. Oh my! I hope i can stay out of it until my party TOMORROW! It is beautiful and delicious.And fast!! I left out the cinnamon and honey and added finely shredded cheddar. Not about the recipe – but that newsletter sign up sheet is very obnoxious as often as it comes up. Can you figure out a way to fix that? 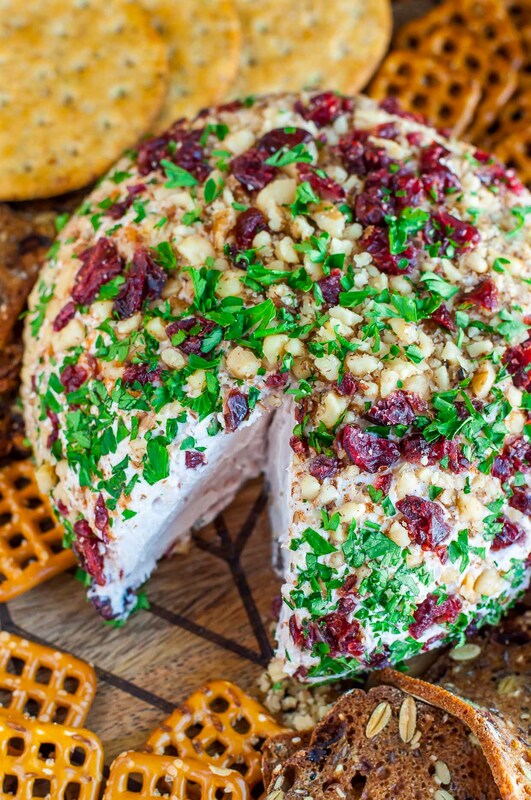 You mention cranberry sauce in this cheese ball – is it your own recipe or do you use the canned one? Can you use another cranberry sauce when there is not time to make yours in the crockpot? Haha, isn’t cleaning out the fridge (or kitchen, in general) the start of so many stories? Or food inspirations, or new recipes? Looks really delicious, cranberry goes so well with soft cheese! 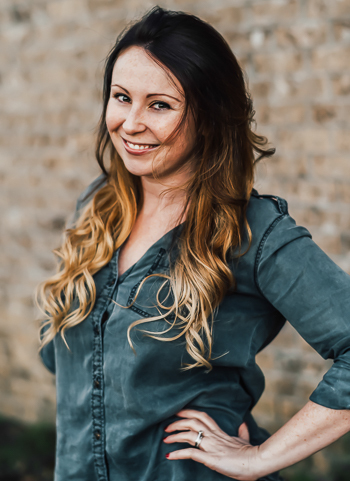 Magic happens anytime I clean the fridge, freezer, or pantry! Cleaning the dishes? So the opposite, lol! I cannot wait until my little chickpea is old enough to help me with that chore! 😉 Thanks Vivian!